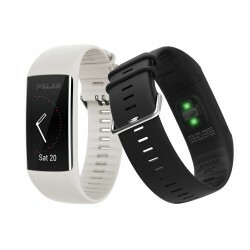 Polar Activity Tracker A370: Waterproof fitness tracker with smart 24/7 pulse measuring! NEW: Sleep Plus: advanced sleeping analysis with calculation of sleeping continuity with all sleeping breaks! Display resolution: 80 x 160 pixels (RGB); Display size: 1.18"
The Polar Activity Tracker A370 is a sporty, waterproof fitness tracker for any situation of everyday life! A slim design with smart 24/7 pulse measuring, activity tracking, a new and advanced sleeping analysis Sleep Plus, GPS via smartphone, Smart Notifications as well as the approved Polar Smart Coaching functions make the use around the clock possible. The Polar A370 is the first Polar product with a smart 24/7 pulse measuring and activity tracking with the technology with two LEDs on the wrist, which is developed by Polar. Being a permanent companion in everyday life, the Polar Activity Tracker A370 turns on the visual pulse measuring on the wrist when the movement intensity cannot be recorded via the acceleration sensor, as for instance when cycling or going for a walk with the buggy. Each activity in everyday life is recorded and makes a more precise measuring of burnt calories possible. Besides the smart use of the 24/7 pulse measuring and the activity tracking, the Polar A370 also shows directly the currently highest and lowest pulse value of the day as well as the lowest value of previous sleeping phases on the coloured touch display. The Flow Webservice explains clearly a new 24 hour curve with activity and pulse values. Sufficient and restful sleep is important for health, wellbeing, and regeneration. The pure recording of sleep belongs to the past ‐ the new, advanced Sleep Plus technology offers more: Besides time, duration, and quality, all movements are automatically recorded with highest precision. Hence, the sleep continuity is immediately calculated with all sleeping breaks. The gained information is valuable, deep insights into the sleep of the previous night (or via a certain period), which is evaluated with a final feedback. In the Polar Flow Webservice, the individual sleeping duration can be determined. During the outdoor training, the Polar Activity Tracker A370 records speed, covered distance, and distance via the GPS a linked smartphone which is carried along. When the GPS signal is not available via the linked smartphone, for instance during indoor activities, the distance is measured via the movement sensor in the watch. The Polar Activity Tracker A370 is completely designed for everyday life, activity, and workouts! Out of more than 100 different sport profiles, the appropriate favourite workout can be transmitted to the fitness tracker. No matter whether it's Les Mills classes, strength training, walking or yoga ‐ the A370 is always ready and displays helpful information during the training, as for instance calorie consumption, heart rate zones or duration - directly on the coloured touch display. The Polar Activity Tracker A370 informs directly after every training session which positive effects the training, which you did, has on the body.